Max is back. The story hits the road early and stays there. The elevator pitch might be “Ellen Ripley vs Boko Haram on wheels”, with Max as the benevolent Michael Biehn or Lance Henriksen character. Since the second instalment the Max stories have been told from the point of view of the ally rather than the protagonist. Max encounters someone worth helping and reluctantly helps them, then buggers off. He has detachment issues. He’s Shane, the loner, who helps communities but wont join them, at least not for long. He doesn’t come round in the end, he reverts, so our task as audience is to understand why. 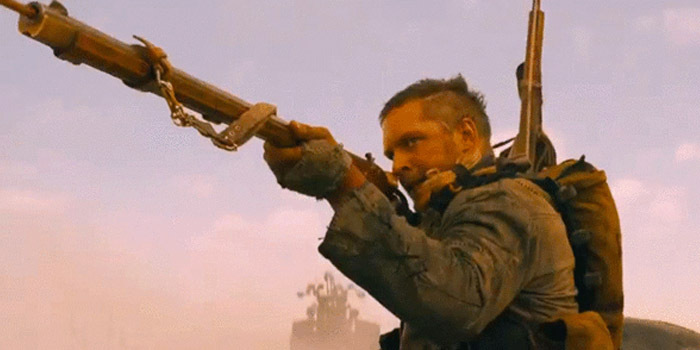 Tom Hardy is well cast but lacks the natural hyperventilating madness of Mel Gibson. Tom’s Max appears too capable of processing everything and coming to terms with it, whereas Mel just looked jammed up to the eyeballs inside, waiting to pop. Given the generous resources at George Miller’s disposal, production elements appear relatively spare. He has funnelled his nine figure budget into getting the perfect angles on the perfect action shots, of which there are a plethora. If George is a ‘mastermind’, his masters is in choreography. Perhaps the availabililty of CGI and the opportunity for more edits have meant more is a little less this time though. Simple stories do allow for lots of action, but Miller is an out student of Joseph Campbell, so a Mad Max movie has themes to exude. They are usually along the lines of finding a reason to live in a world not worth living in. On Fury Road there’s lot to recognise from our own time. Much of the human degradation in its murdered world seems to be with us now, already. As for redemption, we assume George finally gave Hugh Keays-Byrne the well paid gig he deserved .